Our top tips on growing your own herbs from scratch at home - no garden needed! Posted on 31st May 2018 by Gavin in News, Nutrition. comment(s). Wherever we can, we love to grow our own. Whether that's fruit, veg or herbs, there’s just something so satisfying about dishing up a bowl of mouth-watering produce, knowing that it’s come from your own back yard. If you’re looking to start growing your own, then herbs are a wonderful place to start. They add an incredible depth of flavour to dishes, fill rooms with an amazing aroma, and are also pretty simple to grow, too - even for the most amateur gardener! Most herbs can also be grown from your own kitchen, meaning you don’t even need that much space to get started. Here are our favourite herbs to grow from home. Happy gardening! Where would pasta be without fragrant, beautiful basil? This aromatic herb loves the warmth and thrives in bright, sheltered spots (better still if you have a greenhouse to hand!). It’s also worth remembering that it doesn’t like soggy roots, so grow in well-drained soil and water once a day, in the morning. Mint is incredibly easy to grow from a container and is a simple herb for even the most clueless of gardeners. However, it’s fairly greedy and needs regular watering. Treat it well, though, and you can expect plenty of leaves from April through to November. Just be warned – this one can take over your garden! Wonderful to snip over dishes to liven things up, chives are a great culinary staple. With such beautiful flowers, they’ll also brighten up your garden a treat - and the bees love them, too! Another easy one to grow, just remember that you’ll need to keep soil damp to get the most out of your chives. Although Parsley is slow to get going, it’s a worthwhile investment - parsley leaves will keep on giving and giving, for years after they’ve come through. 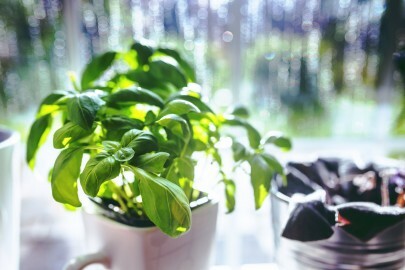 This herb is also perfect for growing from your windowsill, although it’s a heavy feeder and will need regular watering. “Thank you so much for my free packet of Rizopia Gluten Pasta, I have tried it and its lovely, it was so nice I had it two days on the trot. I will be recommending it to all my family and friends as I think its so much better for you, even if you are not on a gluten free diet, much nicer for the stomach.” Chris Kelly, Hertford.